cheap RTK-GPS hardware might soon be available! As mentioned previously I used two loaned u-blox LEA-6T devkits for my robot mower prototype which seemed to get acceptable precision (~10-20cm) with RTK-GPS using RTKLIB. Problem with this solution was that these devkits cost around 300 EUR which is far too much for my intended usage. Until now I planned to switch to Yuan 10 for the next prototype. Yuan 10 costs 97.60 per board (antennas not included) and uses SkyTraq S1315F-RAW chip internally which is able to output raw measurement at 5Hz. It turns out though that there is currently an NavSpark fundraising campaign by the SkyTraq itself which, if sucessful, will get you 2 boards with this chip + active antennas for 50$. At the moment of writing more than half of the campaign time has passed and they are less than 30% funded so if you want cheap RTK-GPS to happen support them and spread the word. 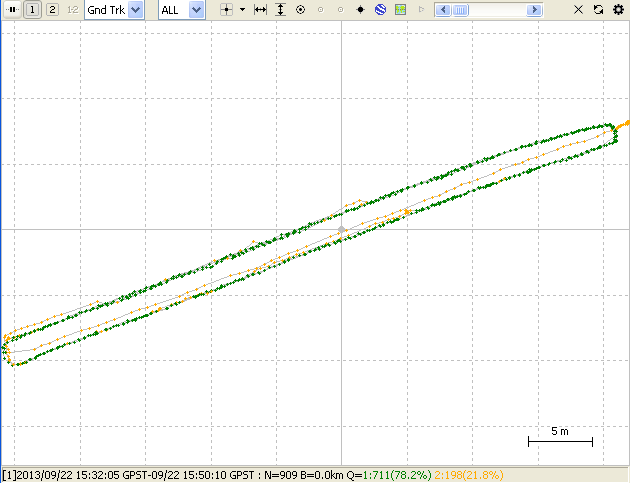 Getting such an high precision GPS solution for so cheap would certainly open many new interesting usage possibilities! PS. This RTKLIB compatible perk was actually added quite late to their project. Main goal is to produce tiny sub 20$ GPS boards that can be programmed, run at 100Mhz and have lots of usable GPIO pins, which is also awesome. 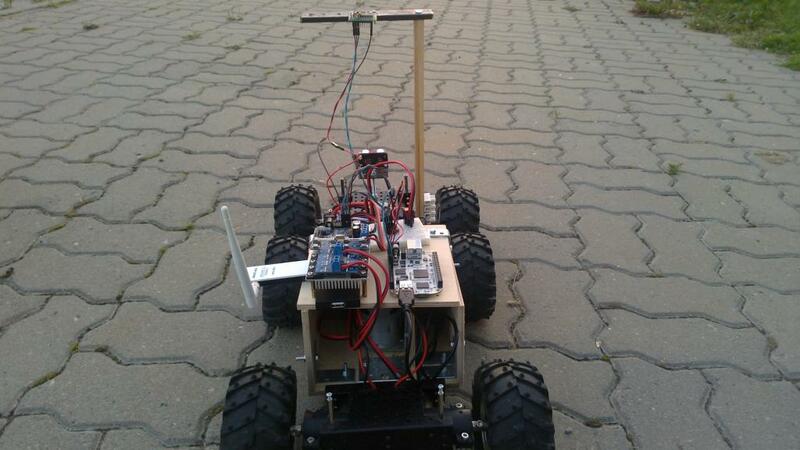 This entry was posted in robotics and tagged GPS, robotics on January 11, 2014 by hadara. 5Ah Li-ion battery replaced with two 4.6Ah NiMH batteries connected in parallel because for me the relative safety of the NiMH outweighs the capacity/weight gains of the Lithium based chemistries. I really don’t want to worry about my house burning down while charging the battery packs. Replaced the Wifi dongle with a far smaller one. The new dongle is using Realtek 8192cu chipset which isn’t supported out of the box as well as the old Atheros based dongle was but I think I got it working reasonably well in the end. Replaced the older generation BeagleBone with Beagle Bone Black (BBB). Moved the bidirectional level shifter that is used for serial communication between the Wild Thumper Controller and BBB from separate proto board to BeagleBone proto cape. Changed BBB’s power supply from 1.5A Recom 78b5.0-1.5 to 3A BEC. This change was actually done because the 3A BEC comes in a nice discreet package which is already more or less protected from the environment and having more power available is just a nice side effect. With that the platform is stable enough that I can actually concentrate on the navigation. 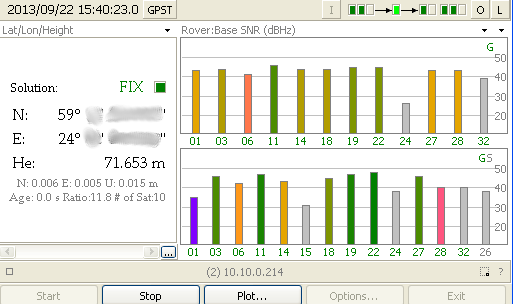 On that front I set up an RTK-GPS solution with RTKLIB and couple of borrowed u-blox LEA-6T evaluation kits. 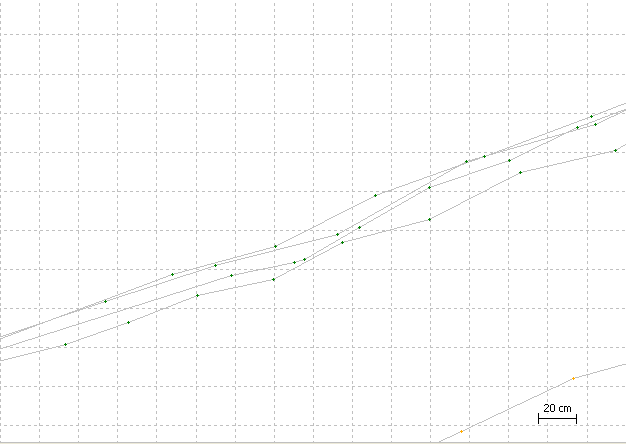 The yellow dots show the FLOAT solution and the green ones show where I had the FIX solution. Basically getting the FIX solution is more precise and means the calculations that RTKLIB does, lead to a single unambiguous solution at these points. Zooming in we can see that the points from different times are at most about 20cm apart which is really good considering that I was just trying to walk in the track of the car wheel and certainly veered off a bit at times. 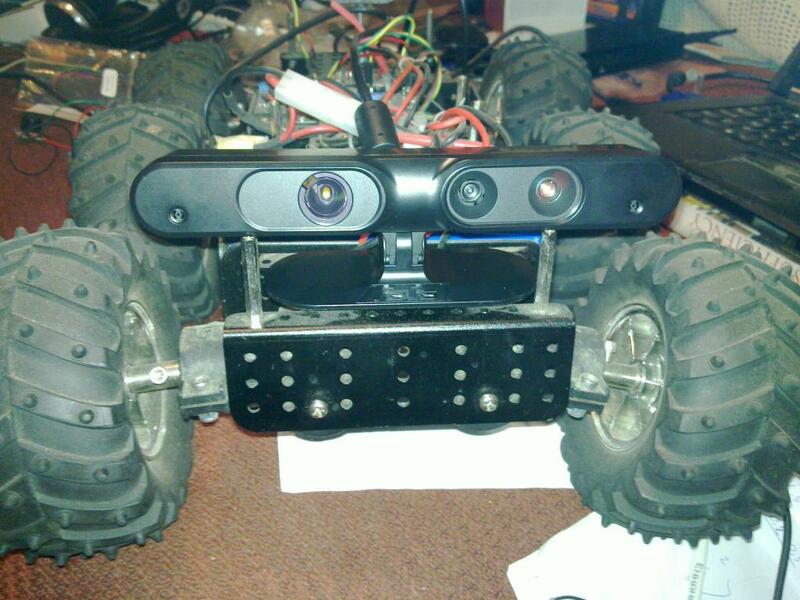 This entry was posted in robotics on September 22, 2013 by hadara. 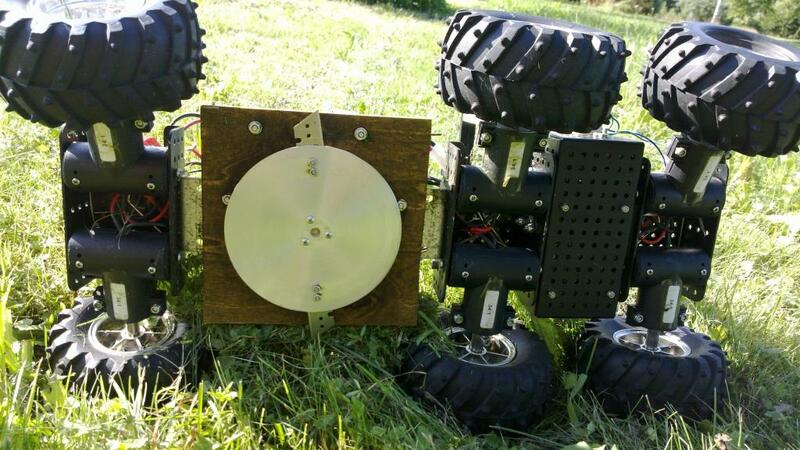 The main changes from the last prototype are the plywood box around the cutting motor and the relocation of the motor controller board to a higher place where there’s more room and less chance of getting covered with wet grass. I also switched the main controller board from Nokia N900 to Beaglebone since I had a bit of trouble getting USB host mode & WIFI working together in a stable manner on the N900. Sadly I managed to fry my Beaglebone Black so I’m currently using an older generation Beaglebone that has so far served as my main automation controller. There are still far too many fragile loosely connected wires all over the place and if you look carefully there’s actually even a breadboard so I still have a lot of work to do before it’s ruggedized enough for its intended purpose. 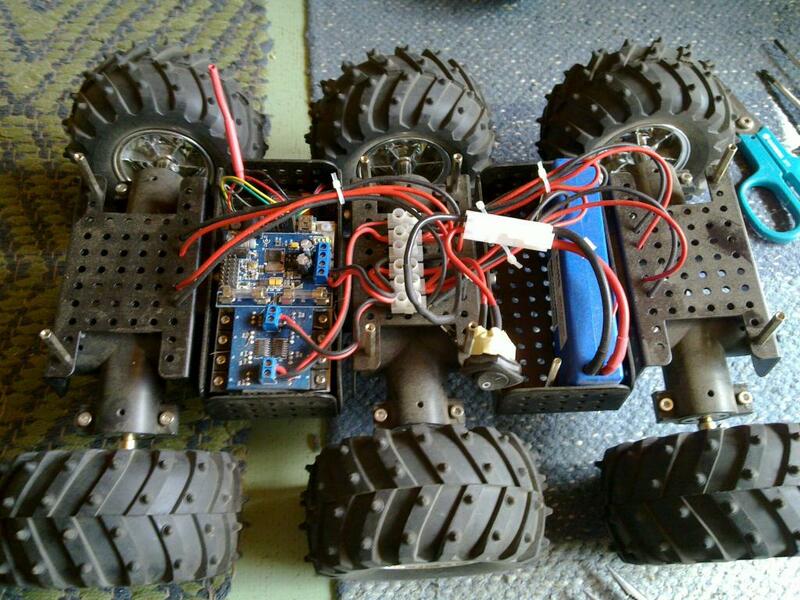 This entry was posted in robotics on September 15, 2013 by hadara. A while ago I moved into new house that happens to have almost 1ha of mowable land which has proven to be a great motivator to start building an autonomous lawn mower. Of course there are many commercial robot mowers available off the shelf so why didn’t just buy one? First of all that wouldn’t be neither fun nor educational but it also seems to cost an arm and a leg (pun intended). 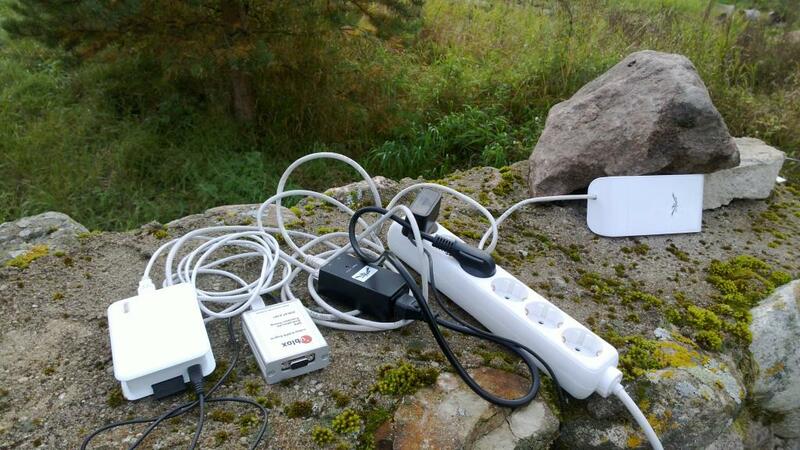 Most seem to be specified for somewhere around 2500 m^2 and cost between 1-2k EUR. Going by these numbers I would need 4 of these to cover my yard which amounts to far more than I’m willing to pay for automating mowing. It’s interesting that these robots seem to be really simple and do not contain much of anything. They just drive randomly around the area that you have fenced with a perimeter wire and drive on the wire to get to the charging station when empty. There’s no navigation whatsoever and the only sensors are bumpers and tilt switches. Safety is achieved by having a rather weak cutter that has small blades and is hidden deep under the mower. It’s supposed to be constantly cutting so it only has to nibble a couple of mm of grass each time around so having a weak cutter works out just fine. I imagine the bill of materials for one of these won’t be more than ~300 EUR so the margins must be huge. 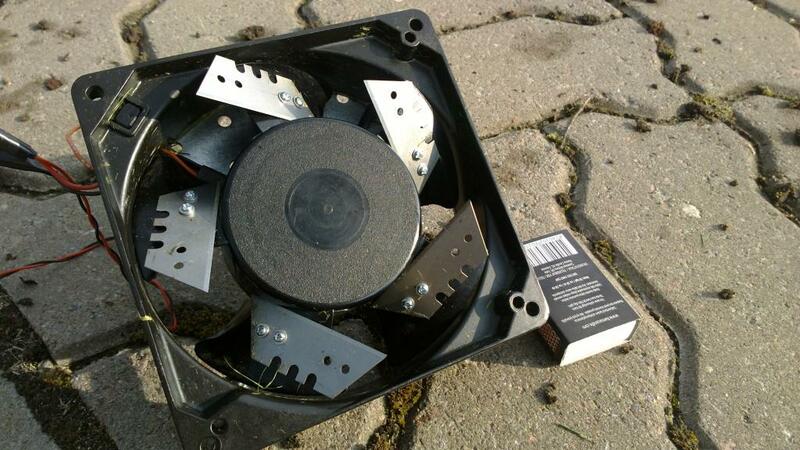 So in order to build an autonomous lawnmower you don’t really need much. One of my favourite DIY builds doesn’t even have a microcontroller. I want to build something that actually navigates though so I will use GPS for navigation instead of the perimeter wire which will make my mower a bit more costly and complex to build. High precision GPS however is an topic in itself so more on that in a separate posting later. What I currently have is a simple radio controlled mower built around 6WD Wild Thumper platform that I had lying around. I also plan to use assortment of other sensors that I happen to have. While in total these components cost as much as a good commercial mower the result will also be far more interesting and since I have acquired these components over many years the cost is mostly long forgotten. If i get it running as well as I like then I will try to build the next version from cheaper components and materials. While it looks evil it didn’t cut all that well so it was back to the drawing board. 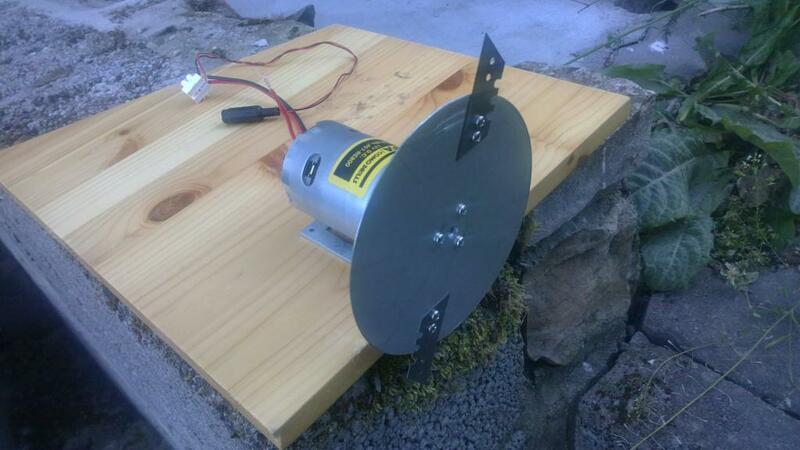 Next I used a really powerful cordless drill motor with a blade holder disk cut out of aluminium sheet. I have no idea what these blades are really meant for but they are rather cheap and available in most local hardware stores. This cutter proved to be really effective and can easily cut even long grass. 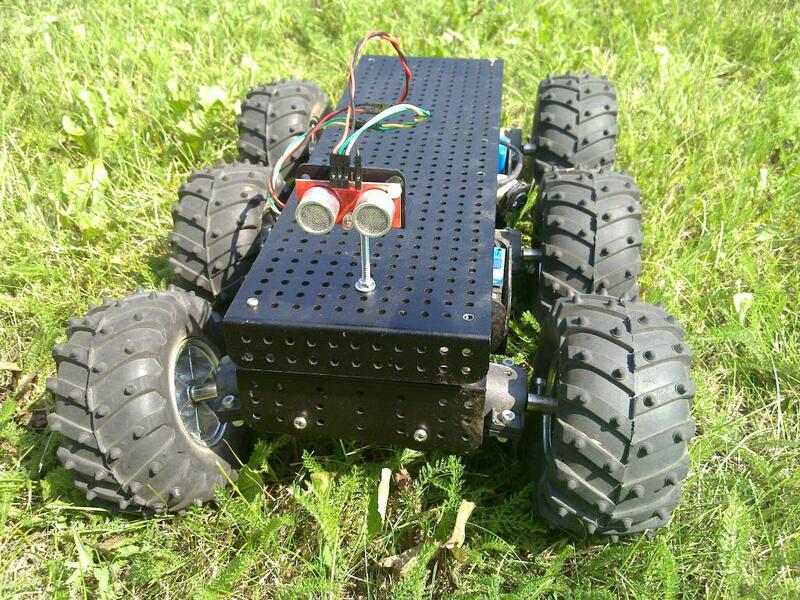 This entry was posted in robotics on August 12, 2013 by hadara. 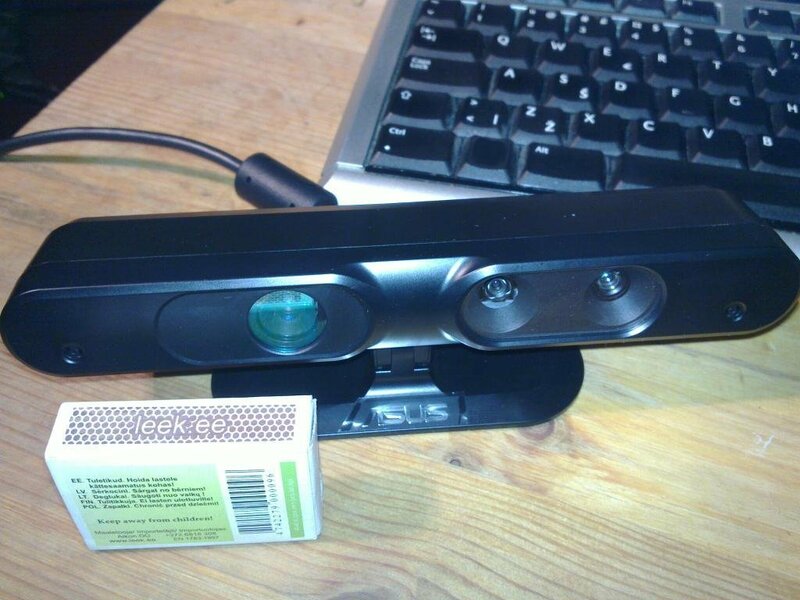 I just bought myself an Asus Xtion PRO Live Depth+RGB camera which I plan to use for robotics experiments. It uses the same technology from PrimeSense for depth as Microsoft Kinect but is about half the size, can be powered solely over USB and weighs around 170g which makes it a better match for robotics. 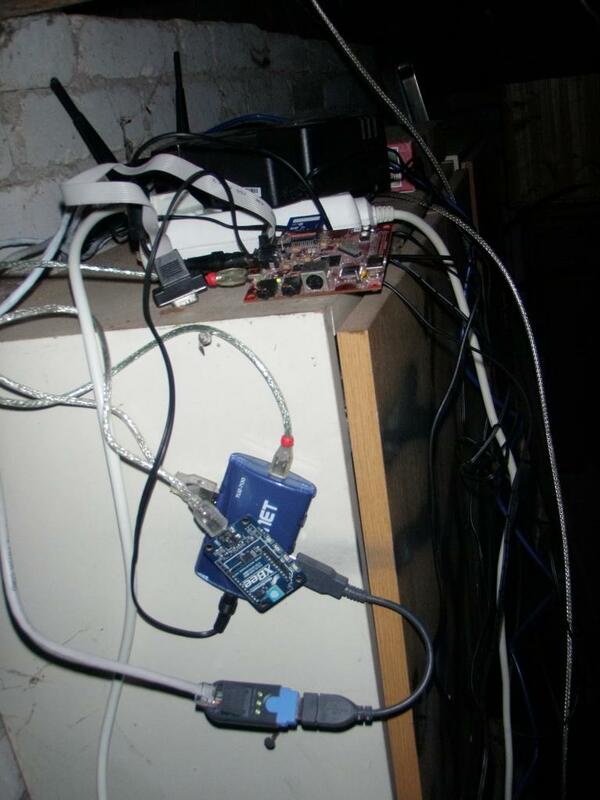 This entry was posted in hacks, programming, robotics and tagged robotics on December 21, 2011 by hadara. 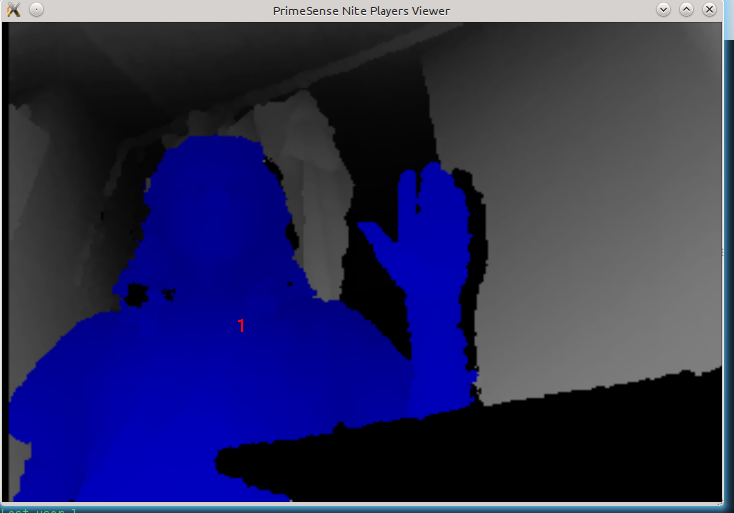 I spent some time experimenting with SRF-08 sonar for outdoors robot navigation usage. While this sonar is said to have range of 6m I haven’t gotten any measurements beyond ~1m even indoors. 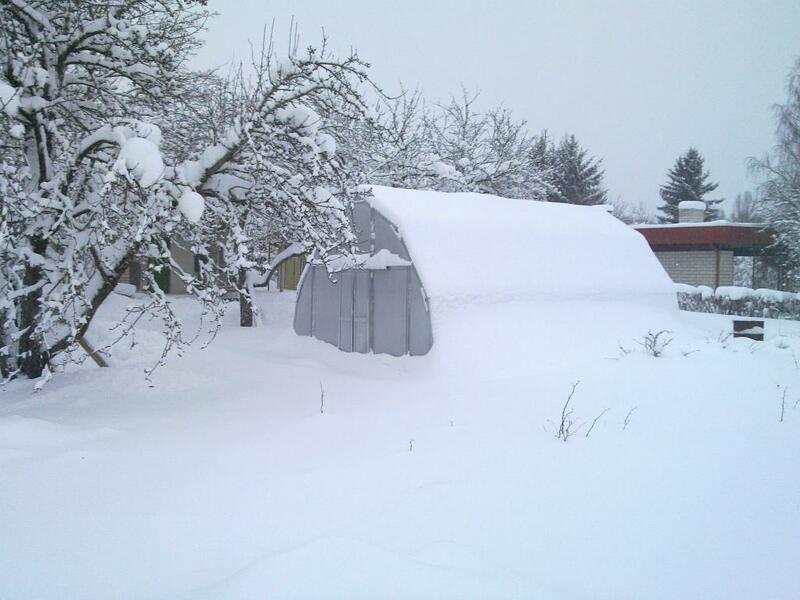 Outdoors it’s of course even more unreliable and there the usable range at the 20cm height seems to be about 30cm, which depends a bit on height of the grass and evenness of the terrain. Since the speed of this robot is about 5 km/h I have about 200 ms from the beginning of the measurement cycle to actually hitting the obstacle. This might be just about enough if I turn up the ping frequency to 10ms range and avoid doing anything else in the main loop. Another option is of course to cap the robot speed to something slower but that wouldn’t be much fun. I wonder if MaxSonar WR range would offer better range in this scenario, especially the models with narrower beam width. For some reason I couldn’t find any actual reviews of its outdoor performance and 100$ seems a bit much just for finding out. 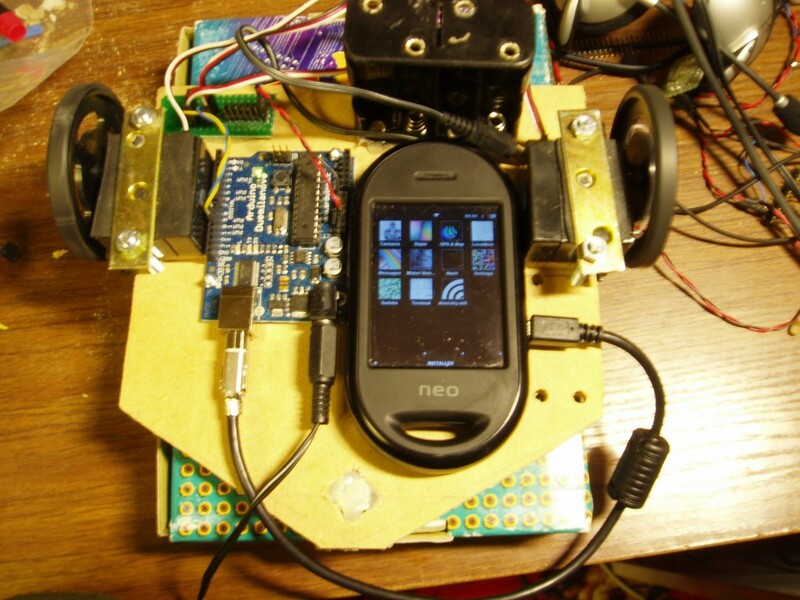 This entry was posted in robotics on July 23, 2011 by hadara. One of my long term goals is to create an outdoor robot that would automate certain kinds of gardening tasks. I have built some simple indoor robots over the years but haven’t really gotten around to building something that can be used outdoors since there’s a rather large gap in the complexity between these two environments. For indoor robots you can basically just use toy car wheels directly attached to the servos and use simple wheel encoders to navigate. 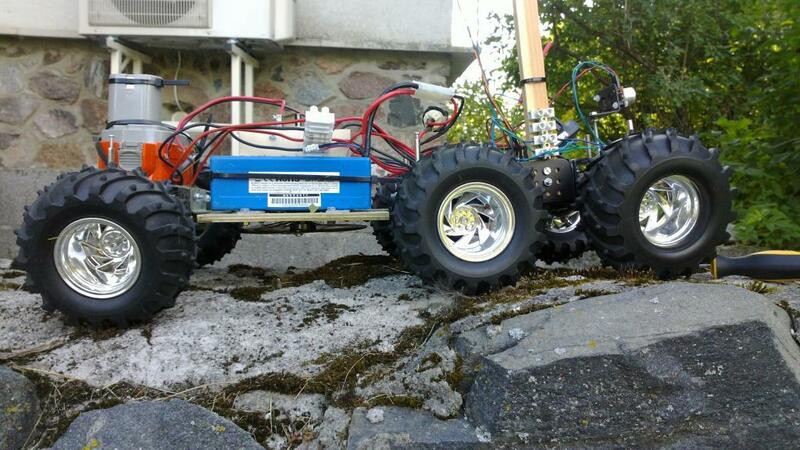 Outdoors you need a lot bigger wheels, DC motors, motor controllers, suspension, large batteries and preferably a shell that provides protection against the elements. Navigation also becomes a challenge – wheel encoders become rather useless because of the constant slippage and GPS is currently still far too imprecise for navigating in a garden. By the end of this year I hope to get it autonomously navigating in my garden which is a precondition for most of the interesting applications but is a very complicated task all by itself too. 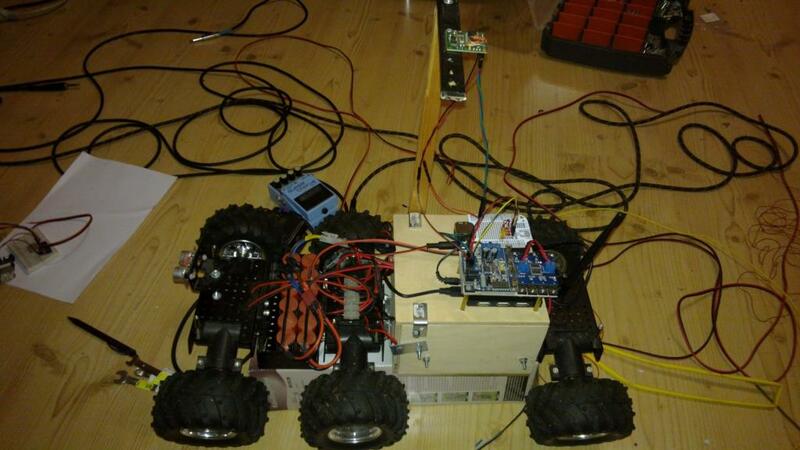 This entry was posted in robotics and tagged robotics on May 15, 2011 by hadara. Which means that I don’t have to deal with actually growing things at the moment and now is a good time to make preparations for the next season. My ideal is to automate it as much as possible, so first I will try to automate the obvious things like watering and ventilation. In the future things like heating and growlights might be added too. I have spent several weekends on that project with my friend Kalle who helps me on the electrical engineering front and finally we have something that more or less works. 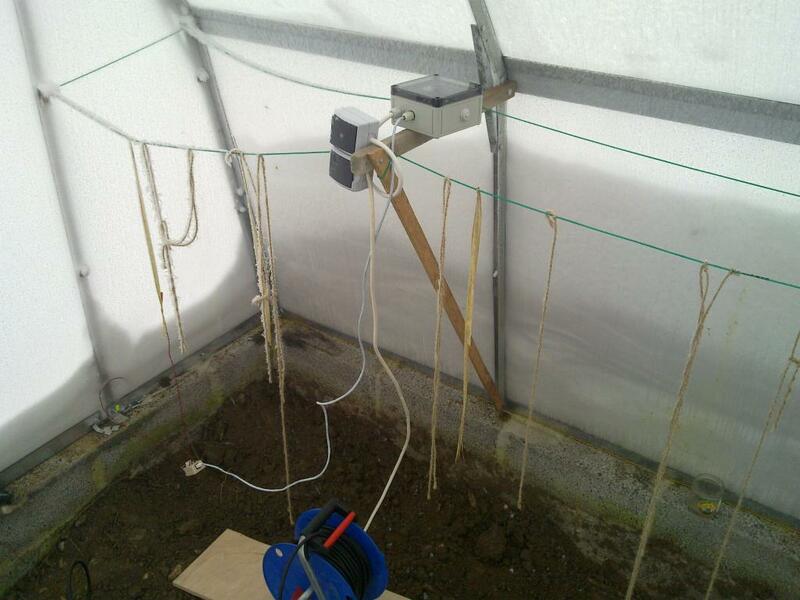 The current solution consists of controller board & sensor board in the greenhouse. 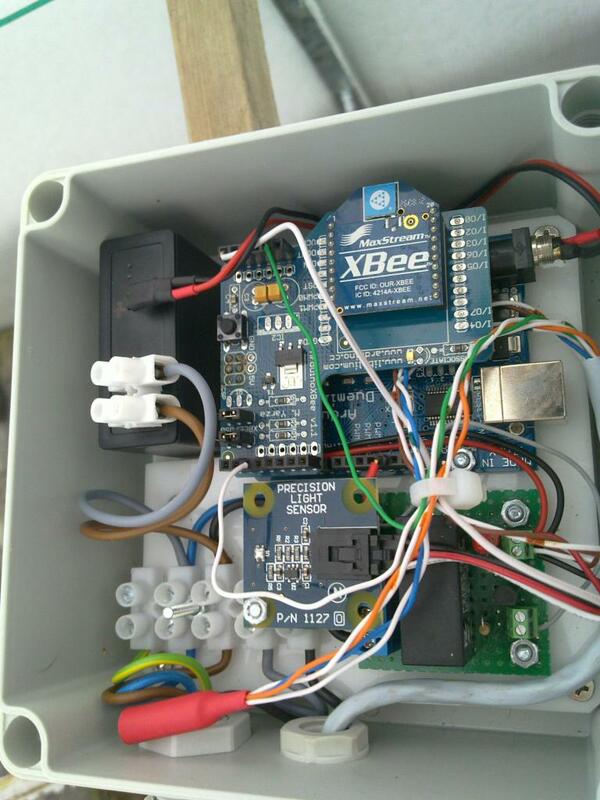 Controller is run by Arduino and controls 220V power outlet & gathers information from various sensors. Bidirectional datalink with the house is done over ZigBee radio. In the house I have a Beagleboard which logs data, draws nice graphs, serves these over the internet and can control Arduino. The sensors and connections are protected from the environment mainly by having them covered by a thick layer of hot glue. First version of the sensor board used LM35 analog temperature sensors which were nice and easy to interface with but thanks to their analog nature were rather sensitive cable length and small voltage flux on the Arduino that was caused by the relay switching and other sensors. Besides LM35 outputs negative voltage for temperatures below 0 deg. C which you can’t measure in a direct way from Arduino. I haven’t had time yet to document the schematics & connections but for similar well documented project you can take a look here and here. The power socket/switch that you see right next to the controller box is meant for the water pump and switch is used to override Arduinos decisions if need be. Where letter indicates sensor type and number is determined by the position. Since the arduinos serial output is really connected to the ZigBee module I can just read it from the other side of the radio link as though the devices were directly connected with serial cable. """converts raw HIH4030 output to relative humidity %"""
# input is expected to be similar to "T-23 T-10 H100 L20\n"
This entry was posted in hacks, robotics on December 21, 2010 by hadara. It’s often said that open source software fosters innovation because people can be inspired by work of others and use it in ways that the original author never thought of. The same applies to open hardware and the Openmoko Freerunner is open both sw and hw wise so it lends itself easily to such unforseen uses. Among other things I use mine for robotics. With high res touch screen, 400Mhz CPU, Wifi, Bluetooth, 2 accelerometers, GPS, USB and other stuff it really has basically all that I have ever needed for a robotics project and I can’t think of anything else that would offer the same specs in similar size for 350€. Obviously you also need a some GPIO lines, PWM, I2C ant other similar IO stuff for a robot and for that purpose I use another open source product – Arduino Duemilanove. The brain that analyzes the sensory input and makes decisions. In this case this is the Freerunner. The peripheral nervous system that handles sensors and actuators. This role is handled by the Duemilanove in this project. Using this separation allows me to more or less easily switch either of those boards for something else. For example when I need more CPU power for the brain part I might just swap the Freerunner with Beagleboard and the only thing that I would have to change is the USB cable that connects the boards. Having the boards connected just by USB cable means that I didn’t have to rip the Freerunner apart and so when I’m finished with hacking on the robot I can just take the Freerunner and use it for other purposes. Another nice thing about this kind of bot architecture is that I didn’t have to solder anything at all besides the USB cable to get a usable robot base, which is important for people who don’t know much about electronics (like me :-)). Since the Freerunner has onboard Wifi I just SSH into the robot over it and this allows me to debug and control it without having to connect any special wires / programmers when I want to change something. Openmokos touch screen is also a really good place for displaying various debug information – for example what the environment looks like from the robot’s perspective. 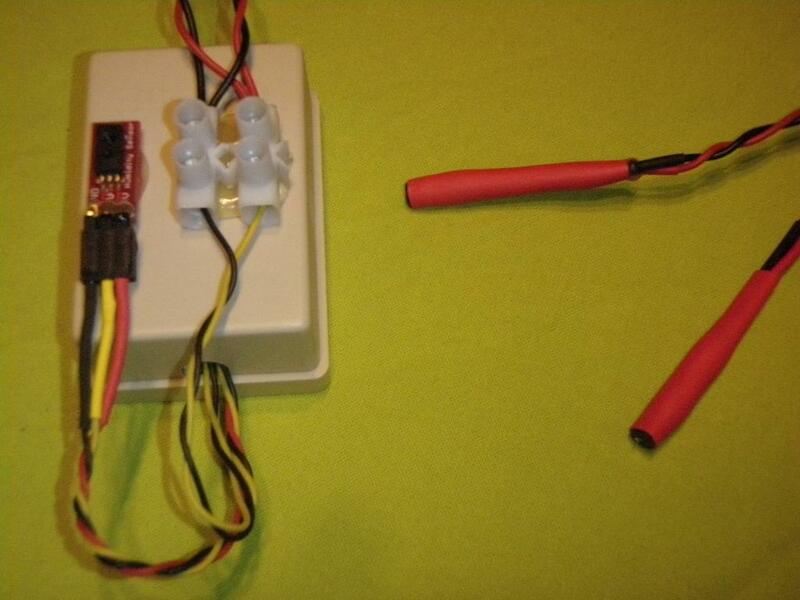 This entry was posted in openmoko, robotics and tagged freerunner, openmoko, robotics on January 11, 2009 by hadara.